There is an expectation of savage cold centered around the Great Lakes while the West is expected to warm up. This outlook is even more pessimistic than last month. Thus, Caveat Emptor is appropriate. This graph has been changing dramatically in the past week. Last week it had most of the West much below rainfall. So perhaps this too should be taken with a grain of salt especially with "Atmospheric Rivers" back in the forecast for the Pacific coast. This graph is also similar to last month's although the extremes are shifted over a bit. The drought is more focused on the West while the above normal rains would be further to the East. 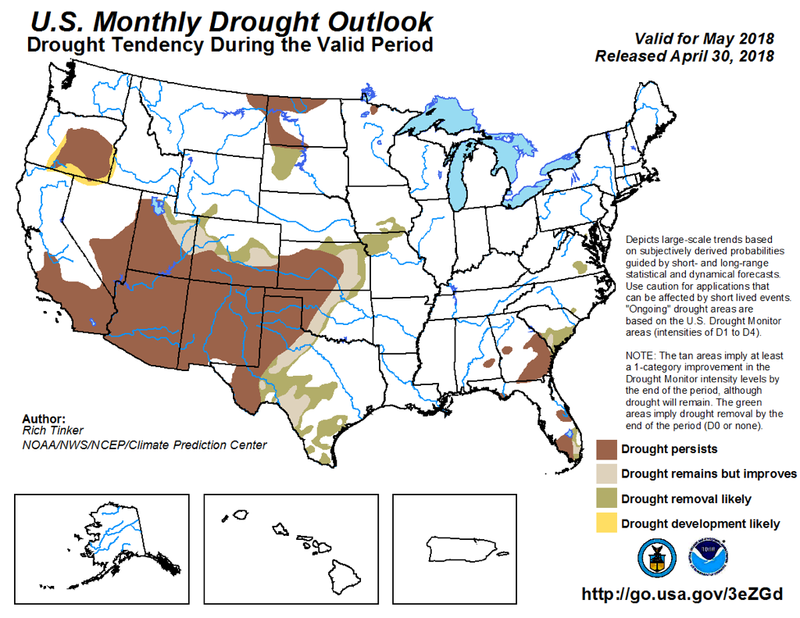 It shows that the droughts in the South have indeed mostly ended. 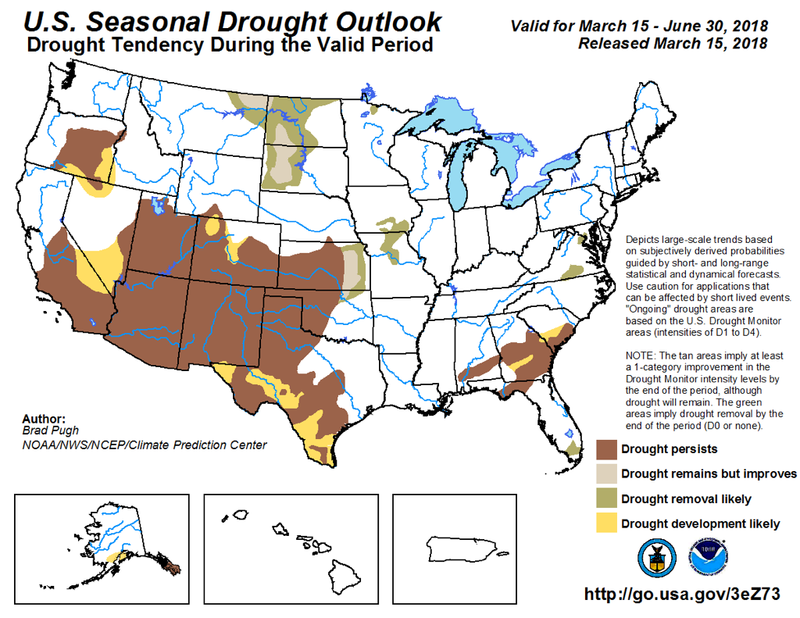 It also indicates that the rains of March were sufficient to prevent drought from starting from the Sacramento delta and parts North. 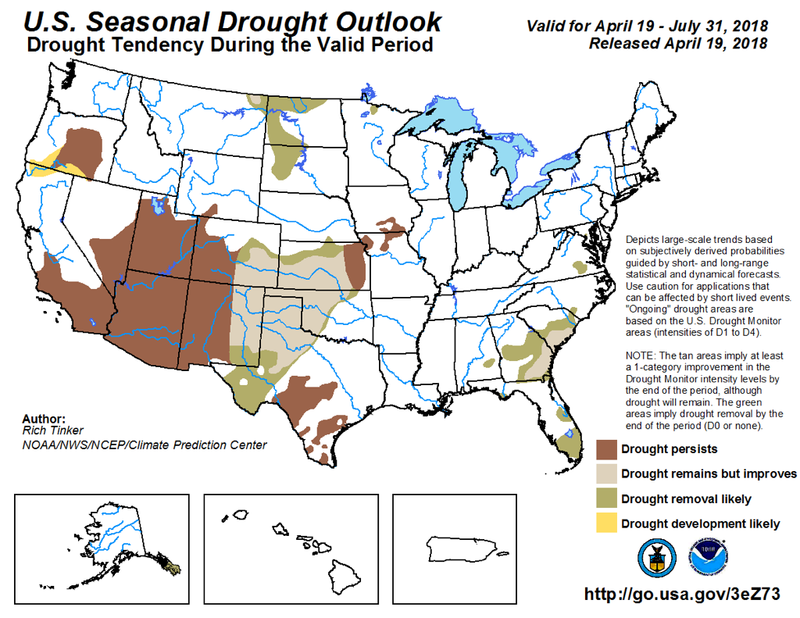 The one exception is a patch of Southeast Oregon which is supposedly going to see an improving drought situation. The 3 month outlook has drought holding steady in the Southwestern part of the United States and adds drought forming in the Southeast. Oddly drought in Southeastern Oregon returns. Drought the Dakotas is supposed to improve but apparently very slowly. It appears that these forecasts may be placing a misguided confidence in the stability of climatology. The shorter-term outlooks paint a different picture that could overturn what has been forecast at the start of the month. Only time will tell. As usual, Like it or not, such are the forecasts we are facing . . . . Indeed, the temp forecast for the middle of the country (Great Lakes south through the Mississippi Valley are not looking favorable. The next week+ much cooler, but the next 3 months a lot warmer. That may start producing convective storms sooner and those are too often damaging; wind/hail can damage houses/cars, but it is also horrible on crops. OTOH, I think the forecasters lament is that anytime they have a 50-50 chance they get it wrong 90% of the time! The potential damage could be real, but I've never seen these 3 month forecasts as particularly reliable. If you look back through the years, these forecasts are more often than not, hotter than normal for most of the country. That definitely isn't happening in California and as far as I can tell it isn't nearly extreme as they forecasting. I'm starting to suspect that there is a flaw in the way greenhouse gases are being modeled. There appears to be simple-minded assumption that greenhouse gases simply increase temperatures in a linear fashion. Judging from the extremes of weather we are experiencing lately, greenhouse gases may be doing all sort of things that aren't expected and that's why the mostly above normal temperature forecasts aren't panning out.
. . . . . Look with the luck we're having with forecasters, even it if shouldn't be possible to fail 200% of the time, somehow they'd figure out how to do it! . . . . . .
I’m in Southern California for 10 days and have been surprisingly chlled whilst here. Need to get back to the mountains so I can warm up. We are back to a everything is warmer than normal sort of monthly forecast. This forecast is similar to the one month forecast. We'll just have to see. It is forecasting below normal rain in the Pacific Northwest and parts of the South, while forecasting above average for areas in the center of the country especially Texas. This could be bad news as this sort of forecast has come to pass. In this case the below normal rains expands in the Pacific Northwest while parts of the East see above normal rain. It shows that the Southwest is seriously impacted as well as parts of Oregon. 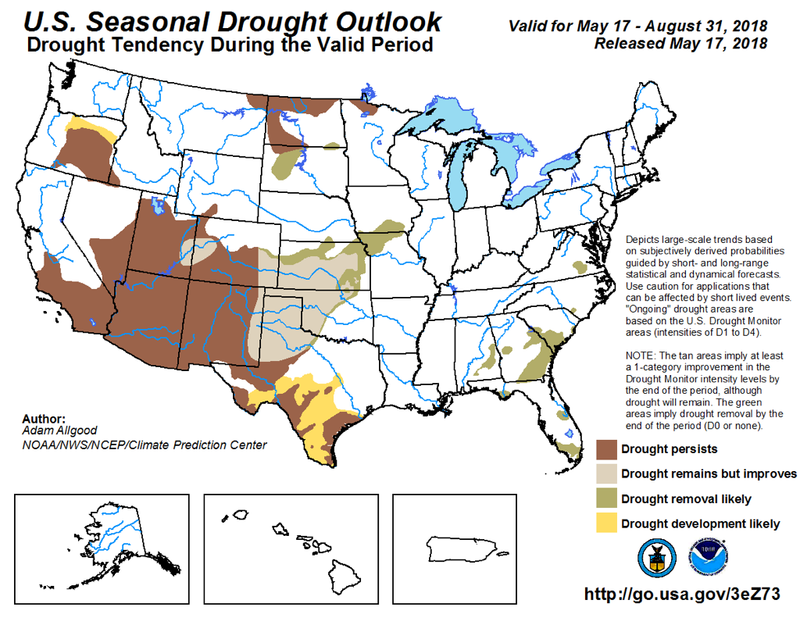 The 3 month outlook has drought holding steady in the Southwestern part of the United States but suggests some relief in Texas and nearby regions. Thanks for posting. This will be quite the summer, one way or the other, for the western U.S. The forecast is continuing the warmer than normal prediction. The areas not explicitly to be above normal have an equal chance of anything, meaning they still could also be above normal. It is forecasting below normal rain in an an odd swath of the country, but once more including the Pacific Northwest. the Atlantic seaboard is expected to be above normal and an odd patch between Arizona and New Mexico. This should be an expectation of higher than normal monsoonal activity. In this case the Pacific Northwest continues to suffer, while parts of the East see above normal rain. Also the monsoonal benefit moves north.